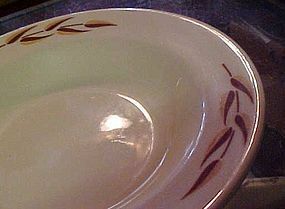 Vintage tan bodied rim soup bowl with three patterns of wheat or willow on the rim. Wheat or willow is tan and brown. Made by Iroquois China and has a date code of G-2. 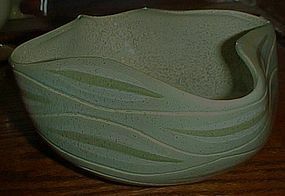 Bowl is perfect, with no evisence of wear. 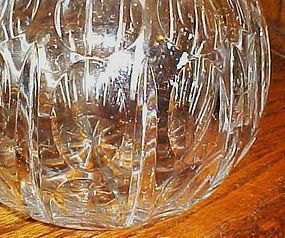 Measures 7 7/8" in diameter. I just have one. Not sure of the pattern number or name. 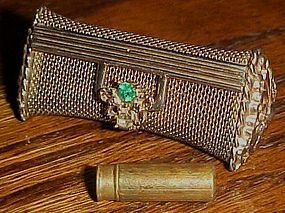 Neat Little Vintage Mesh Goldtone Metal Lipstick Holder for Purse. Rhinestone embellished Latch. It is in great vintage condition. 2 1/8" long x 1/2" x 1/2". A neat vintage item. 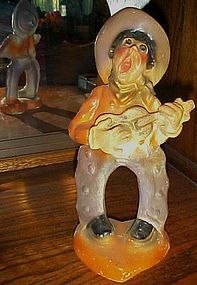 This rootin tootin singing cowboy is from the day... when cowboys were keen, and carnivals came to town. This would have been a joy for any little boy to win and take home to his mother. Made of chalk and stands 10 1/2" tall. He may have been taller if he wasn't so bow legged (lol). Good vintage condition ,no chips or damages, just a little edge wear on the paint here and there and a few small flakes off the paint. I have another one identical shape just a different color. A must have for your 50's kitchen, or nice if you already have some of these and need to add more to your set. There are 6 and 4 are perfect with no stains or wear. Two have an area that is darker like a stain. they are pictured in the left front of the photo , though they are not bad. Nice varnish on all of them. 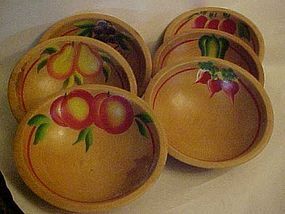 each hand painted with a different fruit or vegetable. Measures 6 1/2" by 5 3/4" slightly oval. Selling all for one price. Vintage lustre ware shaving mug. 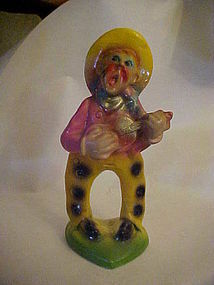 Art Noveau Coal scuttle style. 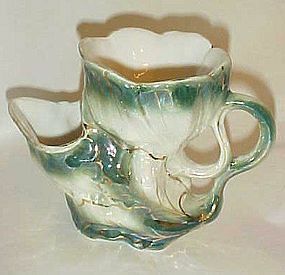 Green and white lustre finish with nice gold trims.Beautifully decorated, and gold highlihts are bright and not worn. Impressed number in the bottom. Appears to be German or from Austria. Perfect condition with no chips or cracks.4 1/4" tall. 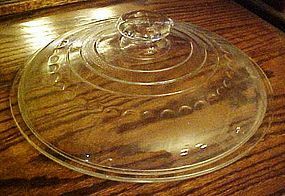 Wagner Ware, C-10, skillet or dutch-oven glass Lid in excellent condition without any chips, cracks or rough edges. This is a very nice larger lid that bears the Wagner Ware logo. This lid measures 12 inches across, rim to rim, and 11 1/4 inches across the inside insert ring and is marked C-10, which means it fits a 10" skillet. I tried it on my 10" griswold skillet and it fits perfectly. PERFECT!! A beautiful beaded handbag from approximately 1945. Has the Bon Soir Tag inside, Hand Made in Hong Kong with Italian Beads. (The beads are glass) Pretty Satin interior with small pouch. A real antique, classic purse. Perfect and Looks to have never been used. Snap closure. 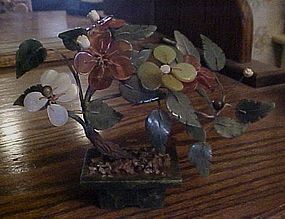 Measures 5" tall x 9" long. 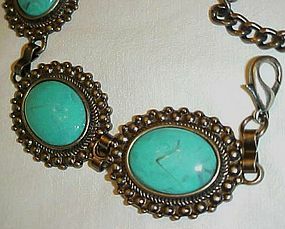 Vintage belt looks like the real deal but is actually just and antiqued silvertone metal with faux turquoice cabochons. 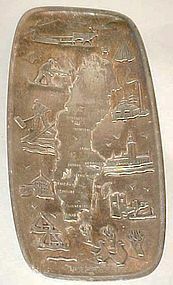 Measures 39" long. Conchos are 1 1/2" x 2". Heavy and durable, and is in nice condition. 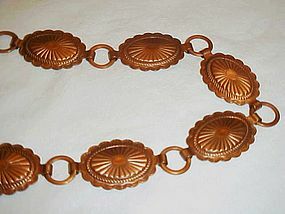 Vintage copper small size concho belt or hat band 26"
Solid copper oval solid copper conchos. Made for a small waist or maybe to be used as a hatband, Excellent condition. No makers markings. Conchos measure 1" x 1/2". This was in a cedar chest at an estate, and had been packed away since 1953. 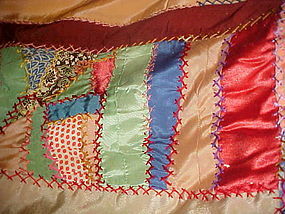 Made of old silk scraps, and mostly emroidered with a feather stitch on the seams. Probably 1/4 needs to be embroidered. Pins are still in it, and old newspaper that it had been folded on to keep it neat. Cotton batting is pinned and basted on. Shown in photo it is on a queen size bed with ample hangover on the sides. No holes or rips, as it was never completed, just put away. 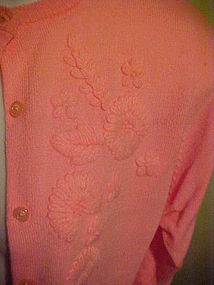 Beautiful vintage 60's hot pink sweater with flower embellishments on front and lower sleeve areas. Front button style. Lightweight and very soft. perfect when you don't need a haevy sweater. This has never been worn and is still in the original Mode O'Day box from the boutique. Box is worn, but has kept the sweater perfect. Tag says "Imported for Mode O'Day 100% Acrylic Full Fashioned Made in Taiwan 38. "Mode O' Day California Fashions" on the box. 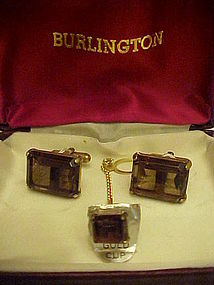 Nice vintage men's set of Burlington cuff links and matching tie tac. Faceted smoky quartz or topaz, I'm not sure, these are in the original box, and it is the only Identification I have for them, other than knowing the are 1950's or older. Original sticker behind the tie tac says GOLD CUP but I see no markings on the metal, and have no way to test. They are beautiful and probably worth much more than we have them listed for. Beautiful condition.